In this information service about chia trade, we publish information about the international trade in chia seeds and its sustainability. The information is from our own sources and from others. 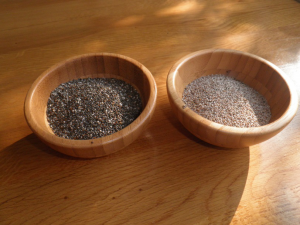 Chia seeds are a highly nutritious food that was first cultivated by the Aztecs in Mexico in pre-Colombian times. The seeds have a high content of unsaturated fatty acids, including ALA, which are considered very healthy. In addition the seeds contain high levels of protein and fibre, but little carbs. They are considered a superfood. The chia plant (Salvia hispanica L.) is native to Southern Mexico and Guatemala. The commercial re-introduction took place in Argentina in the 1990s. Bolivia, Paraguay and Argentina are now the major producers, but France and Australia are also starting production. Since the introduction of the crop to Europe in 2009, the market has grown at double-digit speed. The import volume was about 20000 tons in 2016. The EU novel food law has slowed down market development, but the import procedure will become easier as of 1 January 2018. Mercadero helps chia exporters and producers to find a market for their products. For this, we work in projects and act as trade agents. We also help importers and food manufacturers to source chia seeds from reliable sources with good quality and safety systems. Mercadero provides you with news and updates on the chia trade and market through our website, focusing on business and sustainability. Mercadero organised a business tour for chia exporters from Bolivia and Argentina, visiting individual buying companies, the Novel Food unit of CBG – MEB and exhibitors at the Anuga Trade Fair in Cologne. Mercadero successfully compiled and submitted a chia novel food notification dossier, in order to obtain approval for trading and extended use of chia seeds from our client. We are keen to participate in projects that make chia trade and value chains more sustainable. The European Union only allowed the marketing of chia seeds in 2009. In this year the European Commission approved the product as a novel food, but they set certain restrictions on its use (Commission Decision 2009/827/EC). The European novel food law classifies food products as novel if there is no substantial consumption within the EU prior to May 1997. Restrictions on its use continue to apply to date, although they have been relaxed somewhat (Commission Implementation Decision 2013/50/EU). The maximum use of chia seeds is currently 10% in baked products, breakfast cereals and fruit nut and seed mixes. For prepackaged chia seeds as such the allowed use is not more than 15 g per day. In November 2015 the European Commission agreed on a new novel food legislation. This Regulation No 2015/2283 on Novel Food will apply from 1 January 2018. It stipulates that approved novel foods are placed on a “Union list”. In our interpretation, any company can market products on this list, provided that they meet the specific requirements for its use and labeling. Under the previous legislation companies had to follow a notification procedure to obtain authorisation for marketing. This was a tedious process. So from 1 January 2018 onwards, any company can market chia seeds.